Joggling Hijinks | Where's my backpack? Walking through Charleston, South Carolina, I couldn’t shake the feeling I had inadvertently drifted into another era; one filled with lace gloves, doffed hats, horse-drawn carriages and a sense of time stretching out before me. Warm sea breezes and deliciously soft, slow southern accents eased my pace, lulling me into quiet contemplation as I observed the romance slinking around every corner of this captivating city. Every so often, on a shady porch or in the green of a lawn, my eye landed on a rather unusual bench of sorts, with great sturdy feet and a single, oddly elongated plank serving as the seating area. The lines were simple and elegant and captured my imagination. 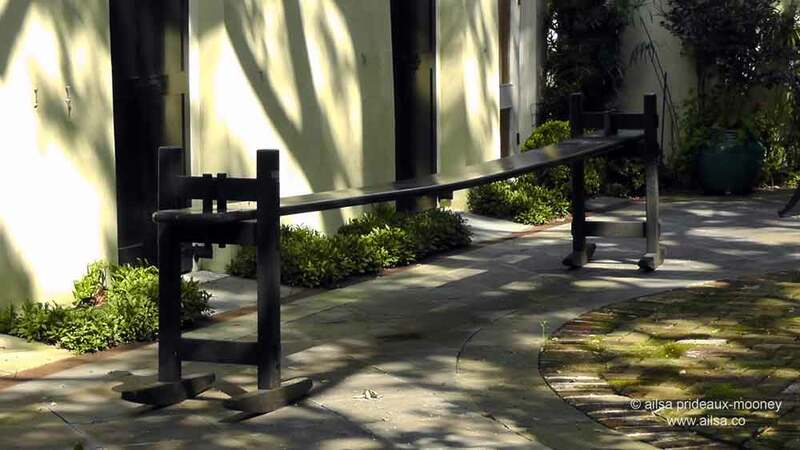 It is most commonly given the joyful name “joggling board” and these unusual benches are to be found all over the Lowcountry of South Carolina. The pliable board bobs up and down when you sit on it, intended to simulate the gentle motion of a horse-drawn carriage. One legend claims that the first joggling board was made at Acton Plantation in Sumter County near Stateburg in the early 1800s. Cleland Kinloch ran the plantation, and when his wife passed away, his sister, Mary Benjamin Kinloch Huger arrived in Acton to help him run the household. While she was there, she wrote to her cousins in Scotland, telling them of the arthritis that was causing her terrible pain, and they wrote back sending her plans for a joggling board, suggesting that she could use it as part of an exercise regimen that might ease her pain. She had one of the plantation carpenters follow the plans and the joggling board was born, soon spreading across the state. Oddly enough, there is no evidence of a joggling board being made at Gilmerton House, the Scottish estate where the plans were supposed to have been drawn. However, in 2010 a joggling board was brought to Gilmerton House by a South Carolinian relative of the current owners who heard the history and felt the joggling board should revisit its roots. The joggling board also earned itself another name; a courting bench, because it was used to the advantage of astute courting couples under the strict supervision of prim and proper chaperones who insisted they keep a respectful distance. The boy would sit at one end; the girl at the other, and during the course of their conversation they would shift around and the board would bow in the middle, causing them to slip towards the centre until at last they would meet in the middle. Legend has it that no house with a joggling board on the porch would ever have to worry about having unwed daughters. This entry was posted in Photography, South Carolina, Travel, United States and tagged history, humor, inspiration, photography, photos, travel, writing. Bookmark the permalink. Delightful story Ailsa, I think I feel a challenge coming on…. I loved joggling boards as a kid! I remember them sitting outside of S.C. coastal restaurants, and we’d load a whole passel of cousins on them and bounce. Great memories! Oh, how interesting! 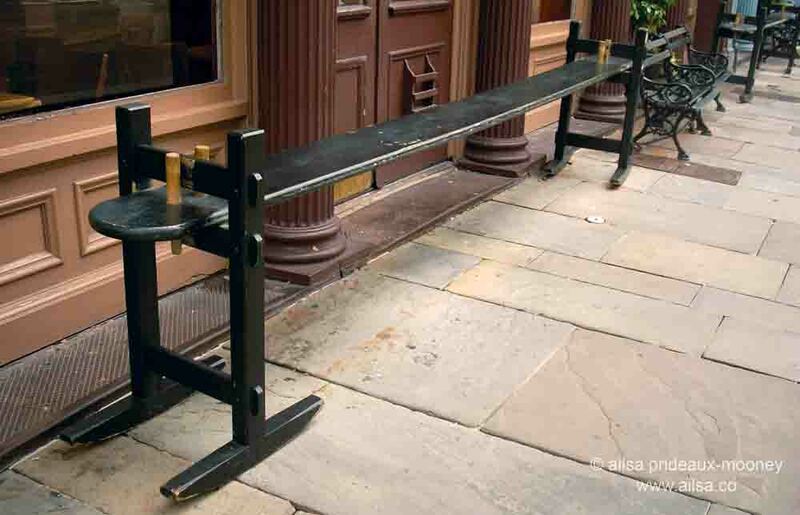 You must link this to my new Bench Challenge Ailsa (https://smallbluegreenwords.wordpress.com/bench-series/) I want one too!! We love these joggling boards. You can see them up and down the SC coast — on some very nice porches! I want one of these benches, too! Wow, that is so interesting. Those are neat. That’s fab, I can just picture them sliding gradually to the centre! I actually wondered that myself and looked up the construction of them – they’re made of southern yellow pine which is apparently incredibly strong and pliable, perfect for an avid joggler. I’ve seen photos of entire families sitting together on a single joggling board. Alright ! As soon as we build one, I will sure share photos with you, an avid bench lover ! I had no idea … I’ve never heard of joggling boards before and it sounds like fun 🙂 Such an interesting story! Is that second bench in front of Hyman’s Seafood on Meeting? If not, they need a few of those cool benches. There’s always a waiting line in front of the place. I can’t help but think I recognize that building. Charleston is our favorite vacation place! I was ablе tօ findd gߋod information from yoսr blog posts.